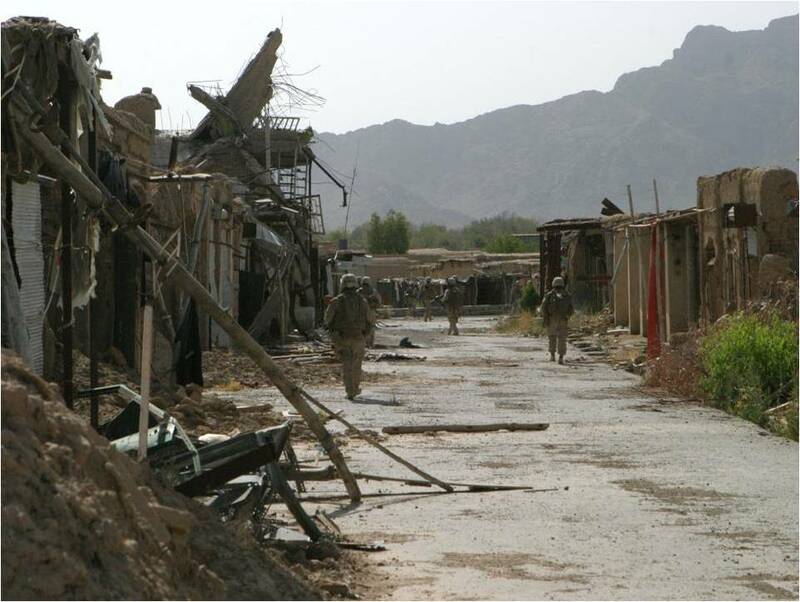 Marines of 3rd platoon 1st squad, Fox Company, 2nd Battalion 7th Marines, conduct a local security patrol in the city of Now Zad, Afghanistan to ensure the safety of the forward operating base on June 08, 2008. Friend of The Captain’s Journal Major Cliff Gilmore (USMC) is in Afghanistan and sends an anecdotal update on Marines in Now Zad that makes him proud to be a Marine. I talked with numerous Marines and hovered in the pre-dawn shadows of the moonscape listening to their chatter for hours and heard only about what they had learned, how they were getting better at this kind of fighting, and how they couldn’t wait to get back outside the wire and “…hunt the scrappy little @&%!ers down.” Point here being, I’m not at all confident the boys in the middle of the fight are thinking in terms of how the folks back Stateside might be able to support them by bringing them home. Mostly they just want more bullets. He took two 7.62 AK-47 rounds to the left side under his arm. His armor stopped the bullets, but he didn’t realize that at first. As he described it, the force of the rounds hitting him felt “…pretty much real enough at the time…” As others described it, he didn’t even flinch when the shots came, did not skip a beat on his evac call, and once he had a chance to inspect his bruised ribs simply asked the doc to tape him up and then went back into the fight. He didn’t ask to go home. Proud indeed. Thanks to Major Gilmore for this update, and watch your six, friend. The Wall Street Journal recently carried a news item on Pakistan’s turn to tribal militias to help in the fight against the Taliban. The Pakistani army is backing tribal militias that are rising to battle pro-Taliban groups, a development that the government hopes will turn the tide against insurgents here in the embattled northwest. Pakistan’s military and intelligence agencies say recent antigovernment violence, including last week’s deadly bombing of the Marriott Hotel in Islamabad, is rooted in Islamist strongholds along the border with Afghanistan, in districts like Bajaur. The militant groups here — Pakistanis allied with Taliban and al Qaeda guerrillas in Afghanistan — are trying to carve out Islamist enclaves along the border. To fight them, the government has deployed more than 8,000 troops in the Bajaur region. The army says it has killed 1,000 militants in the six weeks since the campaign started. But a steady supply of Islamist guerillas is pouring in from Pakistan and Afghanistan, and the fighting shows little sign of abating. The tribal militias could provide a counterweight. “The tribesmen have risen against the militants. It could be a turning point in our fight against militancy,” says Owais Ghani, governor of North West Frontier Province. The province is “providing them financial as well as moral support,” he says. Military commanders say the struggle for control of the tribal region is crucial to containing the spread of Islamist militancy to other parts of northwestern Pakistan. “The threat of Bajaur radiates in all directions and affects the entire region,” said Maj. Gen. Tariq Khan, the commanding officer of the military campaign in the region, last week. The army-backed militia movement has similarities with the Sunni awakening in Iraq, where U.S.-supported Arab tribesmen turned against al Qaeda fighters, says Tanveer Ahmed Khan, chairman of the Pakistan Institute of Strategic Studies. Indeed, the U.S. has also been assisting the tribes with money and training, and has been ever since it was determined that the Khyber pass and Torkham Crossing were problematic and could be lost to the Taliban (one of two main supply routes through Pakistan to NATO forces in Afghanistan; the other border crossing is at the southwestern town of Chaman). Shoring up relations with the tribes in Khyber is one reason for Deputy Secretary of State John D Negroponte’s visit to Khyber earlier in the year (although it should be pointed out that out of fear of the Taliban, only six tribal elders showed up at the meeting). The Captain’s Journal predicted over six months ago that interdiction of these supply routes would be one leg of the Taliban strategy against NATO. But the last statement by Khan is troubling, inasmuch as it betrays a fundamental misunderstanding of the tribal awakening in Anbar. The Anbar awakening can be succinctly characterized by Abu Ahmed’s experience as the Sheriff of al-Qaim, Iraq. The fundamental difference is that the Pakistani troops have withdrawn from their offensive in Bajaur. Pakistan has made it clear through threats and firing on U.S. troops – causing a stand down of U.S. operations across the Pakistan border – that Pakistan will not tolerate the presence of U.S. forces in spite of its duplicity towards the Taliban and reluctance to engage them in combat. So by expecting the tribes to stand up to the Taliban and al Qaeda without the presence or protection of the U.S. Marines or even Pakistani forces, we are expecting something that an even more proud and obstinate people, the Anbaris, couldn’t manage on their own. This is why there isn’t any real similarity between the Anbar awakening and the tribal actions in Pakistan. One might surmise what the outcome will be. The last exchange between Katie Couric and Governor Sarah Palin didn’t go as well as it should have. Therefore, I am laying this out there as my conversational dream – the one that should have happened the last time, and the one that surely must happen the next time. Sarah: Hold on Katie. Sorry to interrupt you – well, actually, no I’m not. Let’s get one thing clear. I’m not going to play your stupid little quiz game. This isn’t twenty one questions with a right or wrong answer. I have no more intention of answering your quiz questions than I do of demanding that you tell me about my reform efforts in Alaska, or telling me what it feels like to deploy a son to Iraq. This is supposed to be an investigative and analytical interview. We all know what John is about. If you want to know something about one of his reform efforts, then ask him. Don’t ask me. If you want to know something about my reform efforts in my home state, then ask me. But either way, prove yourself to be something other than just another talking head. I’ll give you one last chance to conduct a meaningful interview that is useful to the citizens of America. One more chance. Now, I’m the Governor of a state of 700,000 citizens who has the reputation for taking on waste and bureaucracy. Don’t you have a single heavyweight question you want to ask me about my record? Huh, Katie? One last chance. It was Maj. Gen. Jeffery J. Schloesser who initially pointed out that the Taliban would be active this winter despite the common perceptions of a stand down in operations due to the weather. American troops in Afghanistan will step up offensive operations this winter because insurgents are increasingly staying in the country to prepare for spring attacks, a U.S. commander told The Associated Press. Maj. Gen. Jeffery J. Schloesser said a 40 percent surge in violence in April and May was fueled in part by militants preparing stores of weapons during the winter, which generally is a slow period for fighting, particularly in snowy Afghan mountainous areas. He said the U.S. military realized more militants spent last winter in Afghanistan after speaking with elders and villagers who had been pushed out of their homes. The spike in violence in the spring occurred because insurgents were already in position to unleash attacks, though U.S. officials didn’t know it at the time, he said. “They didn’t have to come over the passes, they were already here,” Schloesser said during an interview while flying in a Black Hawk helicopter Monday to a small U.S. outpost in Nuristan, a province that borders Pakistan. Now he is reiterating this position, but adding a new twist concerning the capabilities of U.S. forces and the intent to interdict Taliban operations. A top U.S. general said he expects militant violence in Afghanistan to rise some 30 percent this winter compared with last year, but that he does not think insurgents have the ability to mount a massive campaign during the country’s harsh weather. Winter has traditionally been seen as a down time for fighting in Afghanistan, but Schloesser said offensive operations by U.S. troops this year could dispel that notion. U.S. troops will “take advantage of our mobility and capacity to operate in the snow and to be able to find the enemy,” he told The Associated Press in a telephone interview Thursday. In January 2007, U.S. airstrikes killed some 120 militants crossing the border on foot from Pakistan into Afghanistan, and a video of the attack taken by a drone showed that many of the insurgents — who were walking in a single-file line through mountainous terrain — were barefoot. Schloesser said he thinks militants are now better equipped with boots and sleeping bags but don’t have the ability to conduct complex operations in deep snow or freezing weather. Schloesser clearly intends to use the weather as a force multiplier. But many of the insurgents are at home in Kandahar or other smaller villages in Southern Afghanistan, with families, history, homes and experience in the bitter winters. For these fighters there is no need to traipse through the countryside looking for a place to throw a sleeping bag for the night. But scores of Taliban have been killed too. If the U.S. command has their way, it’ll be a tougher winter for the Taliban. Pakistan Army Fires on U.S.
It’s significant because it is not the first time it has happened. Once might point to a misunderstanding. But the Pakistan Army has again fired on U.S. troops. Pakistani and American ground troops exchanged fire along the border with Afghanistan on Thursday after the Pakistanis shot at two American helicopters, ratcheting up tensions as the United States increases its attacks against militants from Al Qaeda and the Taliban, who are being sheltered in Pakistan’s restive tribal areas. The two American OH-58 Kiowa reconnaissance helicopters were not damaged and no casualties were reported on either side from the ground fire. But American and Pakistani officials agreed on little else about what happened in the fleeting mid-afternoon clash between the allied troops. American and NATO officials said that the two helicopters were flying about one mile inside Afghan air space to protect an American and Afghan patrol on the ground when the aircraft were fired on by small-caliber arms fire from a Pakistani military checkpoint near Tanai district in Khost Province. In response, the American ground troops shot short bursts of warning fire, which hit well shy of the rocky, hilltop checkpoint, and the Pakistanis fired back, said Rear Adm. Gregory Smith, a spokesman for the Central Command. But a spokesman for the Pakistani army, Maj. Gen. Athar Abbas, said Pakistani forces fired warning shots at the American aircraft after they crossed into Pakistan’s territory in the area of Saidgai, in North Waziristan’s Ghulam Khan region. “On this, the helicopters returned fire and flew back,” General Abbas said. Local residents said that one of the two helicopters had entered inside Pakistan territory by about a mile, while the other hovered on the Afghan side of the border. There was disagreement between nations, but the Pakistani position concerning U.S. troops seems certain. “Just as we will not let Pakistan’s territory be used by terrorists for attacks against our people and our neighbors, we cannot allow our territory and our sovereignty to be violated by our friends,” Pakistani President Asif Ali Zardari said in New York on Thursday. But in Washington, Pentagon spokesman Bryan Whitman insisted the helicopters had not entered Pakistan. He described the incident as “troubling” and called on Islamabad for an explanation. It makes no difference. We believe that Pakistan lost its claim to sovereignty over the tribal regions when it ceded its authority and failed to enforce writ in the area. The time should soon be coming that Pakistan chooses sides in the conflict. More money cannot continue to pour into the war on the Taliban through Pakistani hands, with Pakistani troops firing on U.S. troops while also failing to enforce writ in the region. Finally, every minute spent on worrying over U.S. incursions into the tribal areas is a minute wasted, better spent on Pakistan crafting a plan to continue to exist and do so without total surrender to Sharia and Taliban rule. Pakistan is on a precarious perch, and is in dire trouble concerning its future. The focus on U.S. troops shows that it does not yet comprehend the trouble at hand. When the Pakistan Army sees U.S. forces flying overhead, they should wonder where the U.S. is going and why they aren’t participating. So is Pakistan a friend or enemy of the U.S.? It is a dangerous thing to be an enemy of the U.S.
Another factor that has thwarted a more effective response to the Taliban threat is Pakistan’s preoccupation with India. Generations of army officers have been taught that Pakistan’s giant neighbor is the real enemy, and this doctrine is reflected in the disposition and concentration of the country’s half-million-strong army. Troops have been trained to fight a conventional war on the plains of Punjab and Sindh. After 9/11, around 80,000 troops were deployed along the Afghan border, but even this number was insufficient to seal it. Currently, a military alliance between Afghanistan and India is Pakistani military planners’ worst nightmare. To thwart such a possibility, the Pakistani Army wants to retain the Taliban as proxies and is therefore reluctant to crush them. Finally, Pakistan has not yet worked out a political consensus about who the real enemy is. Until the day he left office in early August, Musharraf was regularly castigated in the media as Bush’s poodle doing America’s dirty work by killing his own people. Pakistani TV networks are forever churning out talk shows in which so-called experts criticize the government for fighting fellow Muslims. They conveniently overlook the fact that these same Muslims are responsible for killing hundreds of innocent Pakistanis and Afghans. In post-Musharraf Pakistan, the newly-elected government is struggling to find its feet. The coalition of the two largest parties has already split up. Nawaz Sharif, leader of his faction of the Pakistan Muslim League, has made clear his intention to talk to the Taliban rather than fight them. But Asif Zardari, widower of Benazir Bhutto and now president of Pakistan, has declared his intention to take the fight to the terrorists who threaten to seize control. In a recent article in The Washington Post, Zardari called this the “battle for Pakistan’s soul.” Clearly, this is a battle Pakistan cannot afford to lose. In fact, a U.S. Marine Lt. Col. has recently gone on record saying that Pakistani troops were have at times actively resupplied the Taliban during combat operations. Pakistani military forces flew repeated helicopter missions into Afghanistan to resupply the Taliban during a fierce battle in June 2007, according to a U.S. Marine lieutenant colonel, who says his information is based on multiple U.S. and Afghan intelligence reports. The revelation by Lt. Col. Chris Nash, who commanded an embedded training team in eastern Afghanistan from June 2007 to March 2008, adds a new twist to the controversy over a U.S. special operations raid into Pakistan Sept. 3. But fewer than 15 months earlier, Pakistani forces were flying cross-border missions in the other direction to resupply a “base camp” in Nangarhar Province occupied by fighters from the Taliban, al-Qaida and the Hezb-i-Islami faction led by Afghan warlord Gulbuddin Hekmatyar, Nash told Army Times in a Sept. 17 telephone interview. He had previously alluded to the episode in a PowerPoint briefing he had prepared to help coalition forces headed to Afghanistan. The briefing, titled “Observations and Opinions IRT Operations in Afghanistan by a Former ETT OIC” and dated August 2008, has circulated widely in military circles. Military Times obtained a copy. 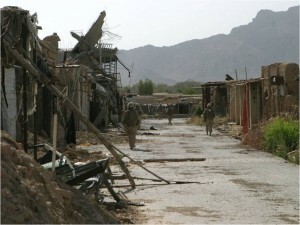 Nash said his embedded training team, ETT 2-5, and their allies from the Afghan Border Police’s 1st Brigade fought “a significant fight” in late June 2007 in the Agam Tengay and Wazir Tengay valleys in the Tora Bora mountains of southern Nangarhar – the same region in which al-Qaida forces fought a retreat into Pakistan from prepared defenses in the winter of 2001-2002. At a critical point in the battle, the Pakistanis flew several resupply missions to a Taliban base about 15 to 20 kilometers inside Afghanistan, Nash said. None of the Marines witnessed the helicopter flights during the four days they were there, he said in a Sept. 19 email. Rather, the supply flights had been reported to them by Afghan soldiers and local civilians in the village of Tangay Kholl. Versus this picture of active assistance to the Taliban, Pakistan has recently conducted heavy operations in Bajaur, and these operations are having a tangible effect inside Afghanistan. [The] operation, which began in early August, has won praise from U.S. officials worried about rising violence in Pakistan and Afghanistan but has triggered retaliatory suicide bombings elsewhere in Pakistan. Some officials believe that the weekend bombing of the Marriott Hotel may have been a response to the Bajaur operations, which the army says have left more than 700 suspected militants dead. Washington says the operation in Bajaur, rumored to be the hiding place of Osama bin Laden, the leader of Al Qaeda, appears to have reduced violence across the border in Afghanistan. A Pakistani Army spokesman, Major General Athar Abbas, has said that Bajaur has been turned into a “mega-sanctuary” for militants and that the military is determined to flush them out. But a rash of U.S. cross-border operations in neighboring tribal regions, including suspected missile strikes and a ground assault, underscore Washington’s concerns that Pakistan is either unwilling or incapable of rooting out extremists on its own. There is still reason to be concerned. The intransigence of the world view and bureaucracy in the Pakistan military will be difficult to repair. Also, The Captain’s Journal still advocates the idea that the first place for NATO confrontation of the Taliban is Afghanistan. Security must be provided for the population in a counterinsurgency. However, if Pakistan can turns its attention away from India and towards the real threat – the Taliban – the effectiveness of the campaign will increase by an order of magnitude. An unusually clear-headed letter appeared in Pakistan’s The Post concerning the Pakistan-Afghan border, ending with the following observation. Ordinarily, coalition partners should not be concerned about border issues when they have a common objective and Former Ambassador Zafar Hilaly made a valid point that the enemy neither respects nor recognises borders, and yet the nation quibbles about border violations. The fact that militancy found a willing stronghold within the tribal belt shows how easily these people surrendered their ‘sovereignty’ to the enemy. Those who vow to defend our territorial integrity against the ‘Farangi’ invader forfeited the right when the first Taliban crossed over to Pakistan after 2001. But someone needs to clean up this mess and it is preferable to have Pakistan at the helm only because our national pride will not permit otherwise. If Pakistan can convince the Americans that they can sort out their side of the border, they must then convince this nation to let them. For the last four years Pakistan has been gaming the campaign against extremists in order to continue to procure money from the U.S. They shoot at empty buildings, pretend to engage the Taliban fighters, and then “make agreements” with them through jirgas. Although the recent bombing of the Marriott Hotel in Islamabad has been called Pakistan’s 9/11, The Captain’s Journal is still skeptical. It is more than just the Pashtuns who have given up their right to defend Pakistan from U.S. incursions. The Pakistan Army’s gaming of operations against the Taliban for U.S. dollars has also lost them the credibility to conduct real operations against the Taliban or complain when the U.S. does. The U.S. must take whatever action deemed appropriate by CENTCOM and its new head General Petraeus. But regular readers of The Captain’s Journal know that we do not advocate treating the campaign as a counterterrorism campaign against high value targets. Special forces, we have claimed, cannot win a counterinsurgency. This requires infantry. Steve Coll of The New Yorker recently made an analogous observation concerning covert policy. On television shows and in the movies, we romanticize covert action of this kind as bold and daring, but military history suggests that it is usually of very limited strategic value. It is usually most effective, as it was during the Second World War, when it serves as a kind of extension or multiplier of a successful overt policy. This may have been the case, too, with the covert action arm of the “surge,” which Bob Woodward has highlighted in his recent book. But covert action fails, as at the Bay of Pigs, when frustrated and desperate Presidents seize on secret war as a substitute for a successful declared or open policy that also involves diplomacy, economic measures, and so forth. The problem with covert U.S. raids in the Pakistani tribal territories today is not that they are unjustified—the Taliban and Al Qaeda are vicious adversaries, and they pose what the national-security lawyers call a “clear and present danger” to the United States and to Pakistan. The problem is that in the attenuating months of the Bush Administration, covert policy has dominated U.S. policy, and often controlled it—and it obviously isn’t working. As an editorial note, we don’t necessarily agree with Woodward’s characterization of anything concerning Operation Iraqi Freedom. Also, Coll’s assessment that more diplomacy and money are needed in order to consider our actions “policy” is amusing. Diplomacy and money – along with covert special forces and CIA operations – have been the cornerstone of our policy in Pakistan from the beginning.